Grace Beside Me contains sensitivities such as racism, abuse and attempted sexual assault. A warmly rendered story of life in a small town that interweaves the mundane with the profound and the spiritual. Thirteen year old Ocean Skye McCardell, affectionately known as Fuzzy Mac, lives within the small outback town of Laurel Dale. Since her mother passed, Fuzzy has lived with her grandparents, known to the town as Nan and Pop, her father employed in the mining industry and unable to care for his only child. Thirteen years of age will become a monumental year for Fuzzy as she begins to see spirits, a long held tradition of Seer passed down through the McCardell women. Navigating adolescence as Fuzzy finds her sense of self, her ancestry and her role as an Indigenous, Irish and South Sea Islander young woman. The writing is incredibly organic, Sue McPherson engages readers within the narrative as I felt as though I was part of the Laurel Dale community. Simple, wonderful storytelling at its finest. Kyliric Masella shines as the character of Fuzzy Mac, a beautiful young Indigenous girl who is coming of age. After her mother died of an overdose, Fuzzy has been raised by her grandparents, her father working in the mines and unable to care for his daughter. Her journey begins on the morning of her thirteenth birthday, coinciding with the spiritual Spooky Month, leading Fuzzy to learn she is to become a Seer of spiritual insight, guided by the spirits of her ancestors. Each episode of the thirteen part series follows Fuzzy as she learns about her gift and the spirits that need assistance before moving on. It entwines the Indigenous spiritual beliefs with a wonderful sense of family, as Nan and Pop are always a positive influence in Fuzzy's life, helping guide her moral compass. Navigating her adolescence, friendship, family and responsibilities, Grace Beside Me is a beautiful blend of diverse Australiana and the celebration of Indigenous country, spirit and history. 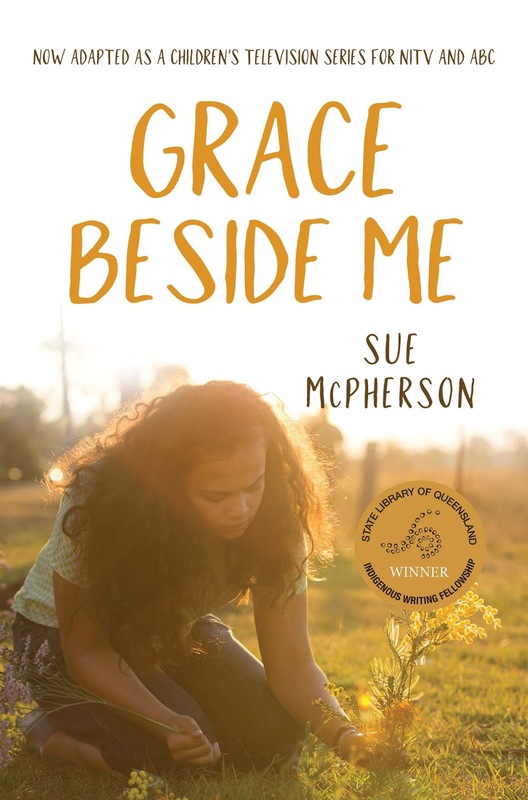 Adapted from the award winning novel by Sue McPherson, published by Magabala Books and previously screened on NITV, you can watch season one of Grace Beside Me on ABC iView here. Or check out the trailer by clicking here. Magabala books is a non for profit arts organisation and independent Aboriginal Corporation with the objective of restoring, preserving and maintaining Aboriginal and Torres Strait Islander cultures and the rights of traditional storytellers and artists. To read more about Magabala Books and to donate, visit their website. That's so cool that the book was turned into a mini series. I hope it did it justice, since it seems like a really important novel. I don't know a lot about the history of Australia, so I love when you share book reviews like these where the author really dives into the past of Australia and how that still affects the country today. Living in the U.S., there is obviously still a lot of racism in the country, but it's interesting to me to see how this occurs, if you will, in other countries and how people deal with it. The television adaption is beautiful, it has a very spiritual feel and wonderfully diverse cast. It's been adapted for a slightly younger audience and blends humour with social issues and the Aboriginal and Torres Strait Islander culture. It's also a brilliant learning tool for primary aged children as the adaptation touches upon the Stolen Generation and the apology given from the Australian government on behalf of the Australian population. The diversity, the community -- it all sounds wonderful! I can only hope more readers and viewers find this show/book. I must admit, I didn't expect the addition of Fuzzy seeing spirits -- I thought this was a coming of age, non paranormal story. Rather than being paranormal, the spirits are very much a part of the Indigenous identity. One example is Fuzzy's connection to her ancestor Lola, her spirit guides and guards the local forest. It incorporates the Indigenous culture throughout the storyline. It was so wonderfully written and beautifully portrayed on screen. This sounds wonderful. I wonder if they'll ever release the show over here. Probably depends on whether producers will be approved for a second series. I have my fingers crossed, I really enjoyed it and wondering if we could use a petition to gather support. My thoughts exactly! I thoroughly enjoyed both but reading the novel before seeing the adaption really gave me a deeper perspective of the town of Laurel Dale and how important the McCardell family is. In terms of community and also as traditional land owners as well. I like to read a novel before watching the movie. So I can understand the nuances. Same, mostly. There's been a few instances where I've seen the adaptations first, like the Harry Potter franchise and I must admit, I preferred the films. The Grace Beside Me adaptation is for younger viewers which will also appeal to the wider audience. Fantastic review Kelly. I am really looking forward to reading and watching this one. You'll really enjoy this Sarah, looking forward to seeing what you think of it. The book in comparison is much more mature, recommended for older readers but the adaptation is wonderful for the middle grade audience and older. You could watch the series while it's still available as the first episode is a lovely introduction to who Fuzzy Mac is and her heritage. I loved both for entirely different reasons but adored the adaptation and seeing a wonderfully diverse cast of Indigenous actors. Something we don't see often enough. It's simply beautiful Ailyn and Grace Beside Me was first published in 2012 by the wonderful Magabala Books, so it should be widely available in all libraries! Don't forget to check out the adaptation on ABC on Demand as well. I can understand as it does have confronting themes but they are written with incredible compassion and care. If you're after something lighter and fun, the adaptation sounds more so your style. It's joyous and spiritual and I love the focus on friendship and families. I'm happy you enjoyed this one so much! I like that the money spent on this book is going towards something that will really help people. Preserving cultures is something we should have started doing ages ago... think of all that we've lost. It was unnecessary and easily avoidable, which only makes it worse. Magabala Books is such a wonderful publisher. Being non for profit, funds are placed back into their programs within the Indigenous arts. An amazing organisation with an incredible history. It really shows the importance of governments needing to step up and fund Indigenous arts doesn't it.